Tips from a wedding industry pro to help make your day great whether you're getting married, in the wedding party or attending a wedding as a guest. Today, a guest blog from my friend and fitness guru Sharon Mosley of Sharon's Fit Talk. Sharon and I have been friends for about 15 years. During that time, I've seen Sharon transform her body into one that is fit and fabulous. She's set goals and completed them. 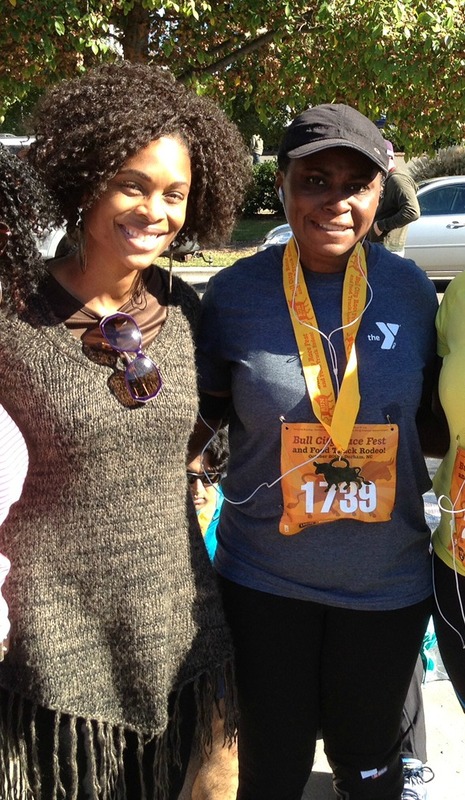 I was at the finish line when she finished her first half-marathon in October 2013. I'm so proud of her. Sharon helps other people get fit and in this blog she shares her tips for brides who want to get in shape whether they have 1 year, 6 months or 3 months to do it. You were asked the question and said “YES”, now what? As a bride-to-be you never run out of things to do when planning a wedding. It is the single most overwhelming, yet exhilarating event of a lifetime. Thinking back, way back, to my special day, there is one thing I know that still rings true for all brides. I didn’t have the date set, know the location or know what would be on the menu. The one thing I knew for sure was that I wanted to look fabulous as I walked down the aisle. So you can imagine how many bridal magazines and bridal boutiques I perused in search of the perfect gown. Yes, this was pre-social media and there were no bloggers to tell me what I should and should not wear or what’s trending. That also meant I had to personally make sure everything else was on point, especially me. I wanted to look like perfection, at least for a day. Never mind what it took to get there. So if you have or have not set a date, you have a year or have just a few months, never fear it’s not too late. Consider a few of these fitness tips to make sure you are the star of the show. 1 year out: A great time to reevaluate and consider personal long term goals. After all you are about to embark on a new chapter in life. 1. It may be helpful to look at two categories: physical health and nutrition. Are you considering losing a certain amount of pounds, reducing your dress size, increasing your level of physical fitness or all of the above? 2. Chart a course of action and consider starting a new exercise routine. This may be deciding to join a gym, hiring a personal trainer or re-committing to incorporating a regular exercise schedule. 3. Nutrition should also play a role. This may be a great time to cut back on eating out, reducing fried food intake or junk food snacking. Learn more about nutritional labels. 4. Begin to break your long term plans into quarterly increments so you are able to assess progress and determine whether or not you need to make some tweaks along the way. This will make it easier to determine what is working and what isn’t. 6 months out: There is still ample amount of time to meet goals and see great results, but not enough time to get comfortable. 1. Set a specific goal and stay focused. Decide if your goal will be to reduce specific pounds per month, drop specific number of dress sizes by your wedding, or to achieve a specific physical activity. 2. Write down goals to help stay committed to your plan. 3. Give yourself a challenge which may include training for a race such as a 5k, a sprint triathlon or increase the distance or level of challenge if you have already participated in those events in the past. 4. Consider some form of cardio/strength training 3-4 times per week. 5. Don’t forget nutrition and what specific foods can be limited such as soda, cake or pizza. Also, consider the money that could be saved once you stop over indulging in these items and how it could go towards paying a vendor on your big day. 3 months out: Don’t fret, it isn’t too late but it is definitely crunch time. 1. Ramp up work out intensity or trying something different if what you’re doing isn’t working. 2. Consider a 30 day challenge to focus on specific areas like squats, planks or push-ups. 3. Solicit some support from family and friends to be accountability partners. 4. Review short term goals such as eating out only once per week, going to the gym 3 days per week or doing 150 minutes of cardio per week and make sure you are stay focused. 5. Cut sugar intake by preparing your own meals and snacks. Don’t bring junk food in the house. What are you doing to get ready for your big day? Copyright Behind I Do . Blog Design by QDONOW Themes .